"Should the "Canberra Times" apply to you for information concerning the identity of the "Gleaner" you may tell them everything but my name". Letter from Harold Lasseter to J. H. Honeysett, Editor, Canberra Community News. Harold Lasseter worked in Canberra as a carpenter and builders labourer from 1926 to 1928, he was also a frequent correspondent to the Canberra Community News and wrote under the non de plume, the 'Gleaner'. There is no doubt that Lasseter had a keen and versatile pen, commenting on high politics, engineering, especially road building, and cabbage farming. On one occasion The Gleaner's sharp and insightful letter to the Editor, questioning the purpose of Royalty, earned the wrath of the authorities who questioned Lasseter's motives and loyalty. Other letters are nonsense in the Lewis Carroll style and a few are pithy commonsense, the more pointed for being well written. The Editor of the Canberra Community News, J. H. Honeysett, actively encouraged Lasseter's contributions, giving him free rein and generous space in the newspaper, Lasseter responded with bright pars, gossip from the construction camps, sports results and commentary, and controversy. The teachers at Telopea Park District School wrote to Honeysett in July 1926, complaining about the Gleaners, "feeble witticisms at our expense", adding that cheap jokes and publishing teachers nicknames were not good for maintaining the dignity of teachers. It may not have occurred to the Gleaner, but he had suddenly and effectively isolated himself from a powerful clique in Canberra's affairs. And Lasseter did fancy himself as a penman, he gave Honeysett a somewhat presumptuous reason for the non de plume, "I recently heard that they (the Canberra Times) were seeking a writer of short stories, snappy pars ,etc, & applied for the possy under the name of the 'Gleaner' only so if I get the job I will know that it is solely on merit". Apparently Lasseter's 'merit' was insufficient to win the job and it's difficult to deduce on what other grounds he had hoped to become a reporter with the Canberra Times, certainly not through influence, as he was to experience through life and to his enduring chagrin, he had none. He was not a recognized writer or journalist and did not move in those circles, Lasseter was unknown in Canberra. Perhaps his letter to Honeysett was a veiled hint to use his influence to secure Lasseter the job. 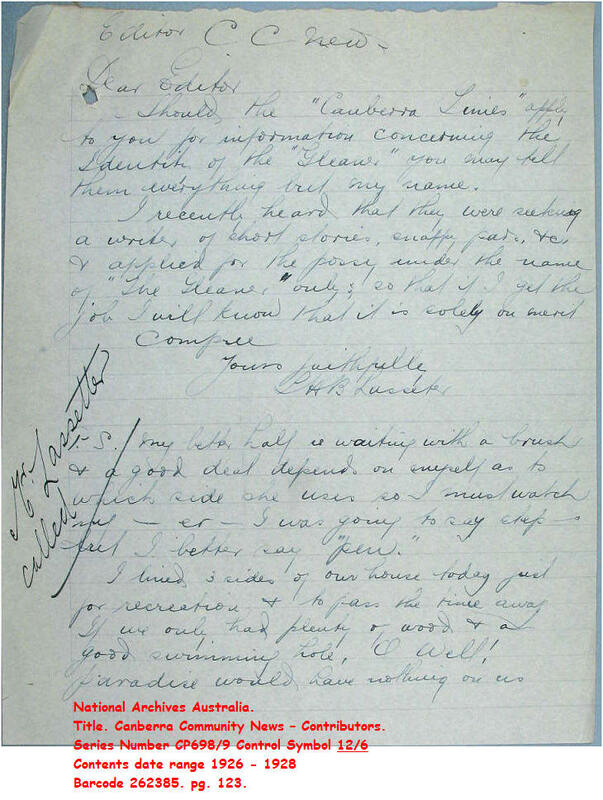 Lasseter's Canberra letters are fine examples of traditional copperplate handwriting, notable for the lack of spelling errors and the use of ampersands, somewhere in his chequered and erratic life Lasseter had been taught to read and write to a level quite above the average for the times. And it's another of history's oddities that Lasseter should become a legend for something that never existed, yet hardly known for his lucid if somewhat quirky writings on many subjects, some of his better work, especially that of the Gleaner, is worthy of collection and commentary. It's sometimes difficult to reconcile Lasseter of Canberra with the author of that dubious scrambled diary. Perhaps Lasseter missed his true calling, given the encouragement of a Honeysett and the scope of a big city, he may have flourished as a journalist. Hubbard Murray. The Search for Harold Lasseter.Chap.8, pg 141-153. National Archives Australia. TITLE. Canberra Community News-Contributors. SERIES No. CP 698/9 C/S 12/6. BARCODE 262385. Pgs. 26 & 123.